Last week at this time I was in a bit of a cooking frenzy doing something I thought I’d never do – preparing to host a coffee hour at my church. Sure over the years I brought in the odd batch of cookies here or contributed a bundt cake there, but I’d never felt called to take on the whole shebang. Until last week. Coffee hour at St. John’s can be almost anything – from a few boxes of donut holes and a fruit platter to chaffing dishes filled with steaming trays of frittata and spicy eggs set alongside platters of homemade baked goodies. There aren’t that many rules about coffee hour other than that there be, well coffee. Plus a little something to nibble on. Oh, and it’s recommended you have some of it ready for the finish of 8 o’clock service so they don’t feel left out of the fellowship created by caffeine and conversation. Of course you also want to be prepared for the swarm of locust children as they sweep through the parlors on their way from Church School to the service. And don’t forget a few gluten-free goodies (after all we serve GF wafers at communion). I take it back. There are rules, which is probably why I’ve made the occasional donations of food over the years but never tackled the task by myself. With the kids back at college after fall break it seemed like I could handle a coffee hour. 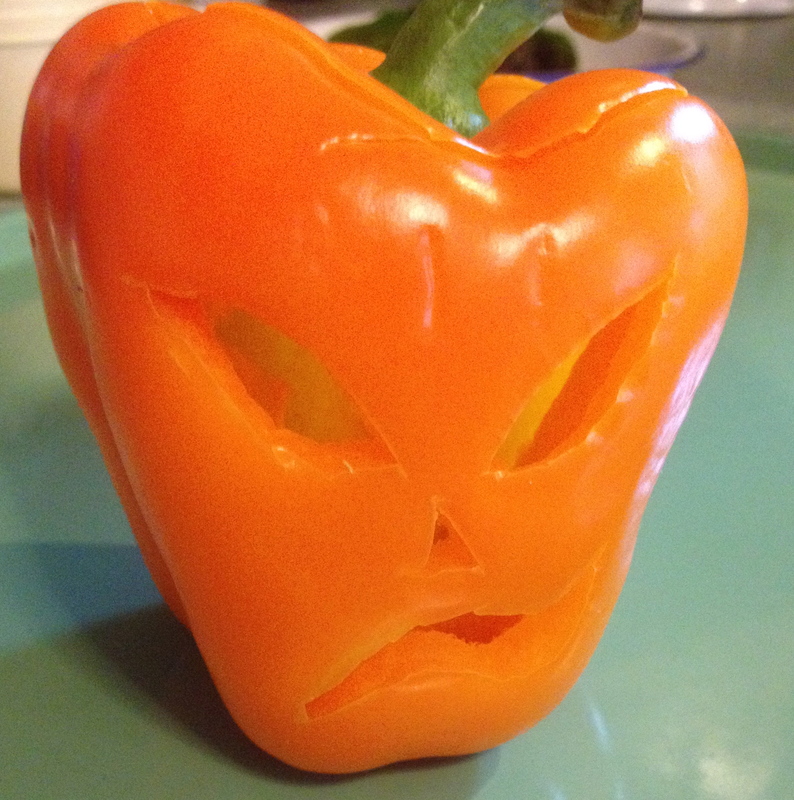 It would be fun I told my husband, we can do all sorts of Halloween-y foods. He agreed. Like Jell-o brains and kitty litter cakes. Yes to brains, no to a litter box filled with edible cat poo at church. I was ready to start cooking. With my list in hand I went shopping. Shawn took me to Restaurant Depot which was all sorts of fun, even if it wasn’t practical for every item. Did I really need twelve dozen eggs and 50 pounds of butternut squash? Not really, but it was great for phyllo dough, crumbled feta, fresh scallions and dill, as well as the frozen chopped spinach and one-pound blocks of unsalted butter all of which could be turned into spanikopita. I made a platter of my friend Rick Ellis’s Deviled Eggs, which Jane Lear has written about. There was the classic quivering Jell-O brain, which amazingly was eaten with great gusto. 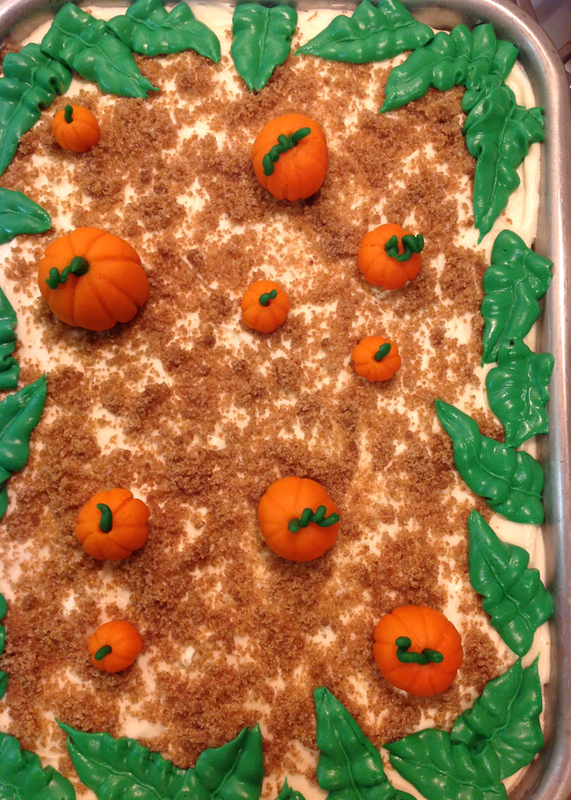 I overheard one 7-year-old tell a classmate, “I like brain, it’s really good.” I also had a steaming crock pot of Carrot-Squash Soup, baskets of Foccacia, along with many other nibbles, including my favorite Carrot Cake, made to look like a pumpkin patch. 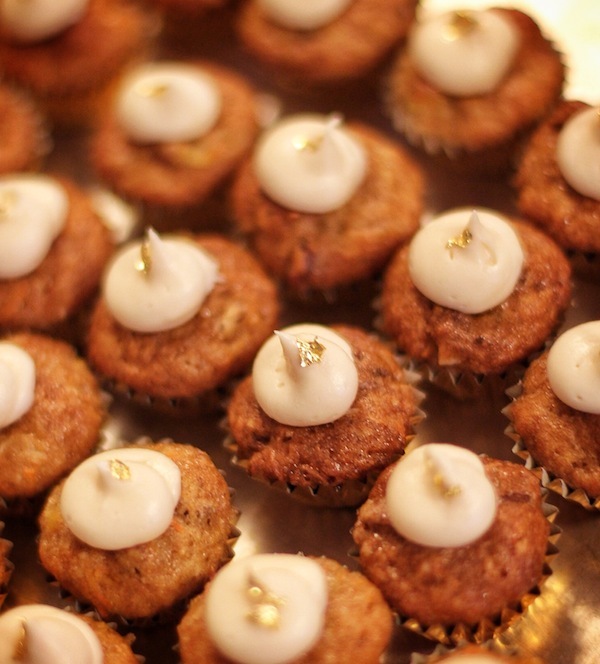 If you are a reader of this blog this carrot cake will look familiar because I’ve previouisly posted it all dressed up as 24 Karat Carrot Cupcakes. Since I’ve been making variations of this cake for over forty years the recipe has seen a lot of iterations. 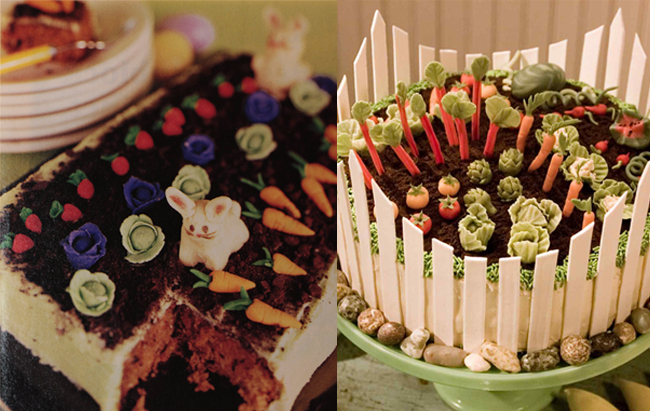 I’ve turned this carrot cake into Mr. McGregor’s vegetable garden for some Easter recipes I developed for FamilyFun Magazine (and interestingly Martha Stewart ran a Martha-ized Spring version of that cake design a year later – coincidence maybe, but who knows?). This carrot cake has appeared gussied up as the wedding cake at a friend’s nuptuals, was once the label of a carrot cake scented Yankee Candle, and of course has been made into the super fancy 24 Karat Carrot Cupcakes. I love this cake because you can dress it up or dress or down and bake it into just about any shape you want to. Definitely a recipe you should have in your cake repetoire. While I’ve tweaked portions and a few of the ingredients over the years, the most important thing I can tell you about making a tasty carrot cake is that size matters. Not the size of your carrots, rather the size you grate them. 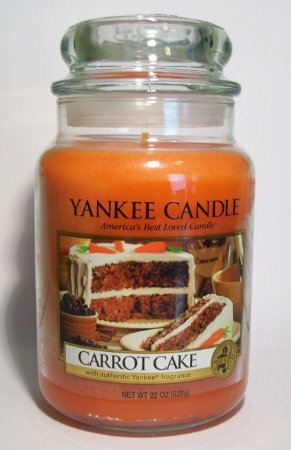 Too chunky and strands of carrot get caught in your teeth, too fine and the carrots clump in the batter. 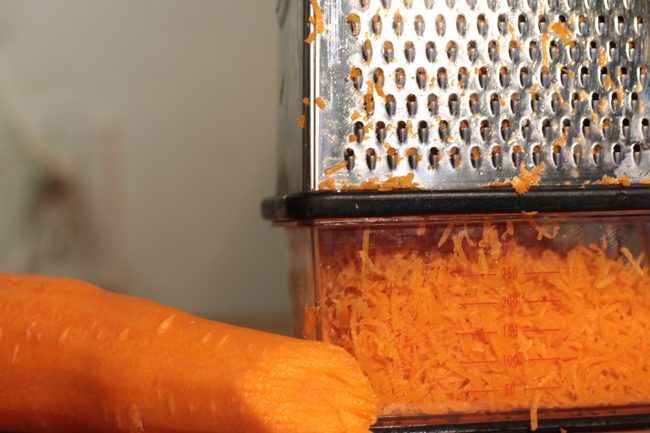 The best tool to achieve the right size of shred is on a box grater. Go for thin shreds and your carrot cake will be golden! If you’re pressed for time or you’ll be serving this to people who don’t like almonds, forgo the marzipan pumpkins. You can always use the little ones they sell around this time of year. Also I didn’t realize I had no grahm crackers to crush into dirt until 11 o’clock at night so I made a quick mix of brown sugar, white sugar, a bit of flour and some cinnamon. It worked very well. Since this cake was served right from the pan I made my cream cheese frosting very soft, with a 2:1 ration of cream cheese to butter, and cutting way back on the powdered sugar. I don’t think it would work on a tiered cake to make the frosting that soft, but it might be okay on cupcakes it you didn’t try to pile the frosting too high. Preheat the oven to 350ºF. Grease a 9″ x 13″ pan (I also use a piece of parchment paper on the bottom). Set aside. Mix together the carrots, oil, pineapples, eggs, sugar, coconut, and walnuts together until thouroughly combined and no clumps remain. Do this by hand as a mixer is just too much for this cake. Sift the remaining dry ingredients together, or if you’re lazy like me just on top of the wet mixture. Fold together until everything is well blended then pour the batter into the prepared pan. Bake for 60 – 70 minutes or until a cake tester comes out clean, and the cake is “quiet” when you listen to it. Cool. In the bowl of an electric mixer beat the butter and cream cheese together until light and fluffy. Gradually sift in the powdered sugar until you get your desired consistency. Stir in the vanilla after 2 cups of powdered sugar have been added. I dyed a cup of frosting green with some paste food coloring to pipe leaves around the edge of the cake. It is totally optional, especially considering every pumpkin patch I have ever visited in Massachusetts at this time of year has nary a leaf. They are quite dead from frost. Last week when I made the marzipan pumpkins I dyed a small chunk green for the leaves and the rest orange for the pumpkins. Gel paste dyes are potent so you may want to knead the color into the marzipan within a plastic bag or while wearing gloves. I ended up with a bit too much green so I created a mutant zucchini. Basically you can treat the marzipan as if it were edible play-dough. Toothpicks are really handy for marking ridges and rolling stem curlicues around. If you’re making this into a garden cake dye small chunks of the marzipan with gel food pastes and go to town! There are some great videos on making marzipan veggies, but honestly I just pull out my seed catalogues and go from there. 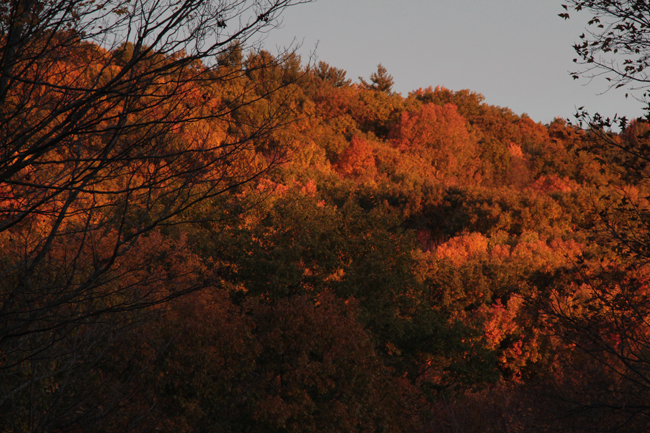 Since I was so busy serving up all the yummy coffee hour food last weekend I didn’t stop to take many photos. 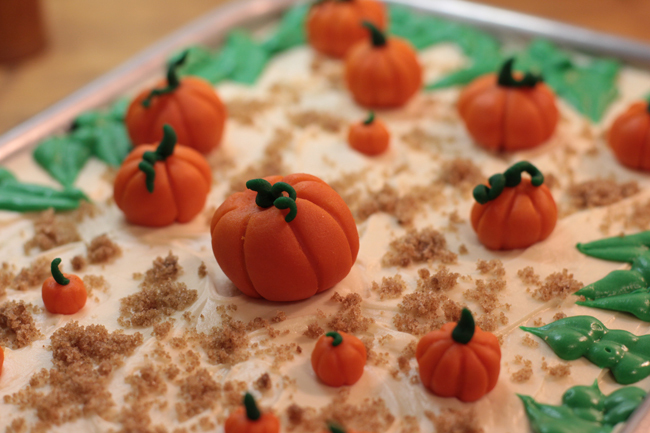 I’d like to give a shout out to my intrepid photo assistant Isabelle, who helped re-create this cake. 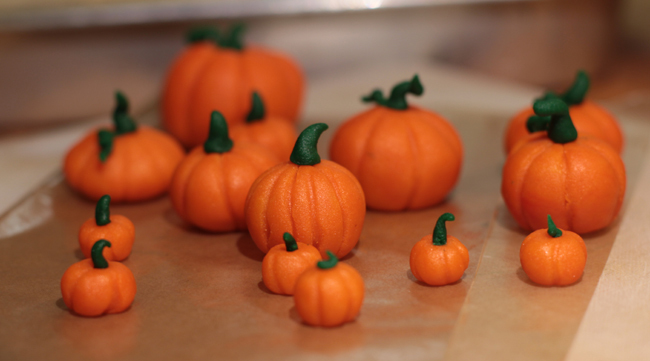 She also rolls a fantastic marzipan pumpkin! And of course lots of coffee hour love to my husband who never once let the coffee pots run dry, while he managed to wash the mountains of dishes I created, and whose heretofor little known talent for pepper carving have been revealed. 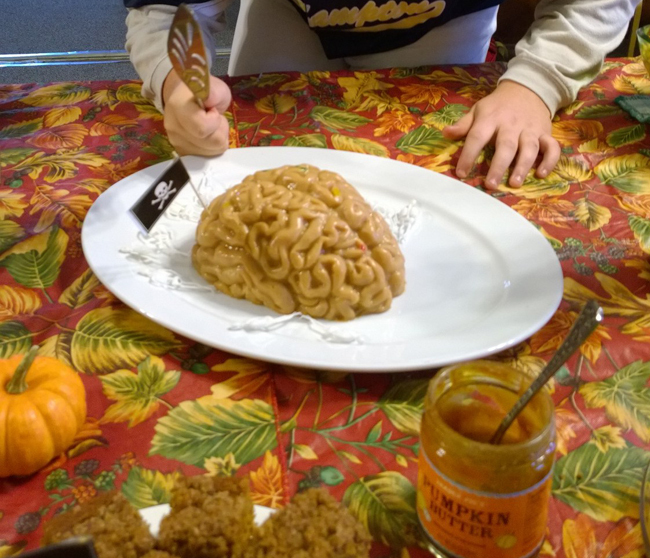 He even snaped a few pics of the brain before it was gobbled up – thanks sweetie! Coffee hour was truly fantastic and certainly the most creative spread we’ve had in the 50-odd years that I’ve been around our church. Shucks, Mr. Fish, you’re making me blush. Honestly I was channeling Gail Binney Sterne who used to put on an incredible coffee hour week after week at St. John’s. Gail’s hospitality ministry was amazing during the time she attended our church (and there have been so many other great hospitality stewards over the years). I remember Gail telling me that for some people in our congregation, what they consumed at coffee hour was the only solid meal they would eat that day. Our church has a wonderful focus on feeding people both at coffee hour and at the Manna meal. We are blessed to be part of such a wonderful, caring group.